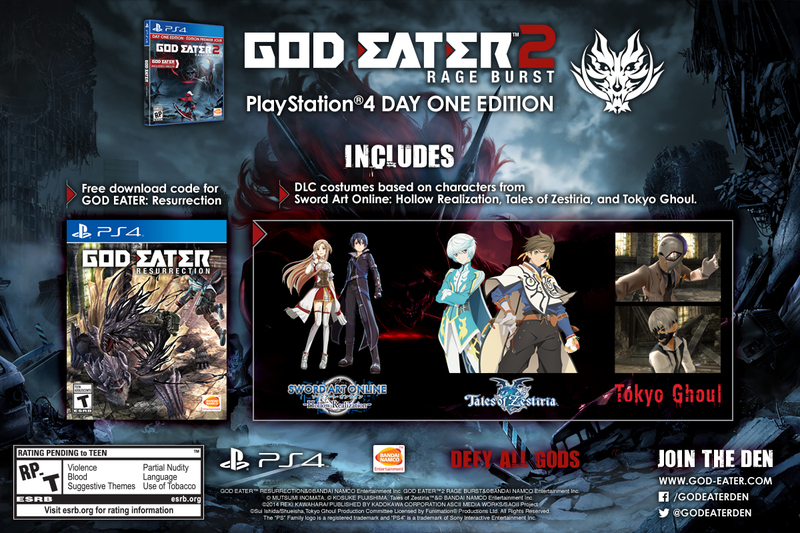 Day One Edition includes free God Eater: Resurrection download. Bandai Namco has announced release dates for God Eater: Ressurection and God Eater 2: Rage Burst in North America and Europe. In Europe, both God Eater: Resurrection and God Eater 2: Rage Burst will launch on August 30. God Eater: Resurrection will be included as a free download with God Eater 2: Rage Burst, which will be available physically and digitally across PlayStation 4, PS Vita, and PC. Pre-orders include costumes based on characters from Sword Art Online: Hollow Realization, Tales of Zestiria, and Tokyo Ghoul. View a new trailer and set of gameplay videos below. A pair of fact sheets follow. Evil Takes All Forms – Take control of the newest recruit to Fenrir’s Far East Branch, a New Type God Eater with a rare ability to wield a variable God Arc that transforms between blade and gun form. Hack, slash and shoot your way through hordes of Aragami and extract evil at its core. The Hunter Becomes the Hunted – Master Predator Style with charge, quick, combo, step and air variations on the God Arc’s devour ability. Rediscover the World – Featuring over 100 hours of content, God Eater: Resurrection features an immersive story driven by deep character development, a robust battle system, and addictive mission based gameplay in a unique post apocalyptic setting. Unite in the Fight for Humanity – Play with up to 3 additional players online to form a cooperative four man cell, perfect for taking on the most difficult of missions. Play with anyone, anywhere – Exclusive to the PlayStation 4 and PlayStation Vita, God Eater: Resurrection features both Cross Play and Cross Save functionality. Play with anyone, anywhere – Exclusive to the PlayStation 4 and PlayStation Vita, God Eater 2: Rage Burst features both Cross Play and Cross Save functionality. View a new set of God Eater: Resurrection screenshots here and God Eater 2: Rage Burst screenshots here.